We did something interesting with our 12 times tables this week! Check out our new, super, catchy multiplication rap!! 12 x 0 is 0 We’re going to be Maths heros!! 12 x 1 is 12 Always be yourself! 12 x 5 is 60 Do your homework quickly!! 12 x 9 is 1-0-8 Wake up early feeling great!! 12 x 10 is 1-2-0 Everyday we learn and grow! 12 x 12 is 1-4-4 We can count to way, way more!!!!!! 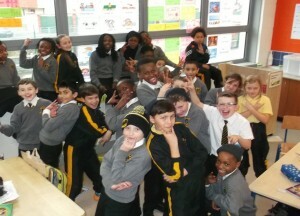 Ms. Passmore’s 4th Class – good team work everyone!